For a 68-pound dog who lived low to the ground, our Trixie sure has cast a long shadow after her passing on 30 June 2007. Gerda and I had always anticipated that when we lost her, the pain would be terrible, but the grief proved to be immeasurably more intense than we had expected. For a month, I could not write. Every day of that month–and every day of the next, for that matter–we were frequently reduced to tears by our loss. A friend of ours, disabled by a spinal injury and confined to a wheelchair, had such a singular and wonderful relationship with his first assistance dog (now passed away) that he has said, given the choice of never having been disabled or never having known that dog, he would choose the dog and therefore the disability. What does that say about the potentially profound nature of the human-dog bond? It humbles you, doesn’t it? He recently told me that when he lost his four-legged companion, he discovered, in his grief, depths of emotion that he hadn’t realized were in him. I understand perfectly, because neither Gerda nor I has previously experienced such anguish as this loss has raised in us. Dear readers, friends, your letters and e-mails have been of great help in the healing process. The news of Trixie’s sudden death inspired several thousand of you to send your condolences, your stories of your own losses, and your heartfelt advice for coping with the passing of a beloved pet. You composed poems, drew memorial portraits of our girl, and sent us books and articles on the subject of losing a pet. We cannot answer all of you, but we have read every word that you have written. You have given us the most generous gift that can be given, the gift of your time, and in your sensitive correspondence is yet another proof that no writer alive can possibly have a more articulate, insightful, and caring group of readers than I do. 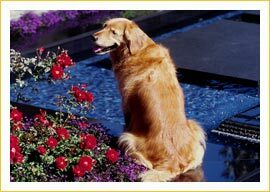 A great many of you sent donations to Canine Companions for Independence, to memorialize Trixie. We were moved by this and grateful for your generosity. Please know that your money could not be put to better use by any other organization. We have worked for many years with CCI, which is a top-drawer nonprofit with a great staff and legions of good-hearted volunteers. The Oceanside, California, campus of CCI was years ago named the Dean and Gerda Koontz Campus. CCI has now renamed that facility the Dean, Gerda, and Trixie Koontz Campus. We will post a photo of the new monument sign on Trixie’s page. Meanwhile, our friends at the Assistance Dog Institute, in Santa Rose, California, another worthwhile organization, will award Trixie Koontz scholarships to students in their bachelor’s and master’s programs. For those of you who may not know: Trixie was bred to be an assistance dog for CCI. She enjoyed 18 months of training with her puppy-raiser and then 6 months of intense specialty training. In her graduation photo, lined up with 12 other golden retrievers, Trixie can be spotted instantly by anyone who knew her, because while all the other dogs sit erect and stately, facing the camera with noble expressions, Trixie strikes a comic pose, legs akimbo, grinning, head cocked, revealing herself for the free spirit that she was. After graduation, she was placed with a lovely and charming young wheelchair-bound woman in the Los Angeles area. After six months in service, Trixie began to limp. X-rays revealed a congenital elbow problem. This had never bothered Trixie before, but the strain of daily service began to impact the joint. After joint surgery, no dog is returned to service. Through the good offices of CCI, shortly before her third birthday, Trixie “retired” to live with Gerda and me. The following nine years were the best of our lives. We didn’t say another word about the experience until later, near bedtime, when we both commented on the incredible thickness of the butterfly’s wings, which were too thick to have been aerodynamic. Gerda remembered them as being “almost edged in a neon rope,” and to me they had seemed to be like stained glass with a leaded edge. No landscaper who works here has ever before or since seen such a butterfly, nor have we; and it danced about our heads at the very minute that Trixie had died three weeks earlier. Skeptics will wince, and I feel sorry for them. I will always believe that our girl wanted to let us know that the intensity of our grief was not appropriate, that she was all right. In sharing this story with friends, I have heard of others who, after losing a particularly beloved dog, had uncanny experiences quite different from ours but which also seemed to be intended to tell them that the spirit of their dog somehow lived on.